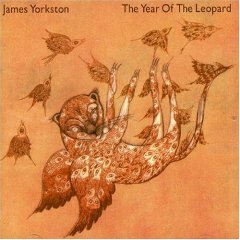 In the past, James Yorkston certainly has made albums that could be considered quiet and understated. With the help of Talk Talk’s Paul "Rustin Man" Webb, however, Yorkston transformed his latest outing The Year of the Leopard into a wonderfully intimate affair. Although it initially invokes feelings of extreme discomfort, its charms, over time, gradually are revealed. In the end, the close proximity to which he places his audience to both his emotions and his music becomes a strength, rather than a weakness. Tucked into The Year of the Leopard’s center is a strange, spoken-word piece titled Woozy with Cider. Rather than sounding like a vainglorious exercise, Yorkston’s brooding rumination meshes with the soft electronic effects that creep through the song’s background in a fashion that makes palpable the disorienting hangover he was experiencing when he penned the poem. Don’t Let Me Down turns even darker. The faint plea in his voice combined with the fragility of the arrangement conveys the sense that although he knows he can’t survive another disappointment, he also is aware that one lurks just around the next corner. I Awoke is filled with sorrowful resignation, and heartache drips from every crevice as his words "could you want her/could you need her/more than I" repeat like a lost and lonely echo.